In 2005 Eclipse Aviation selected Opinicus Corporation to be the official Eclipse 500 simulator provider. Opinicus was to build full motion level D and FAA Level 6 simulators for the Eclipse 500 training programs. 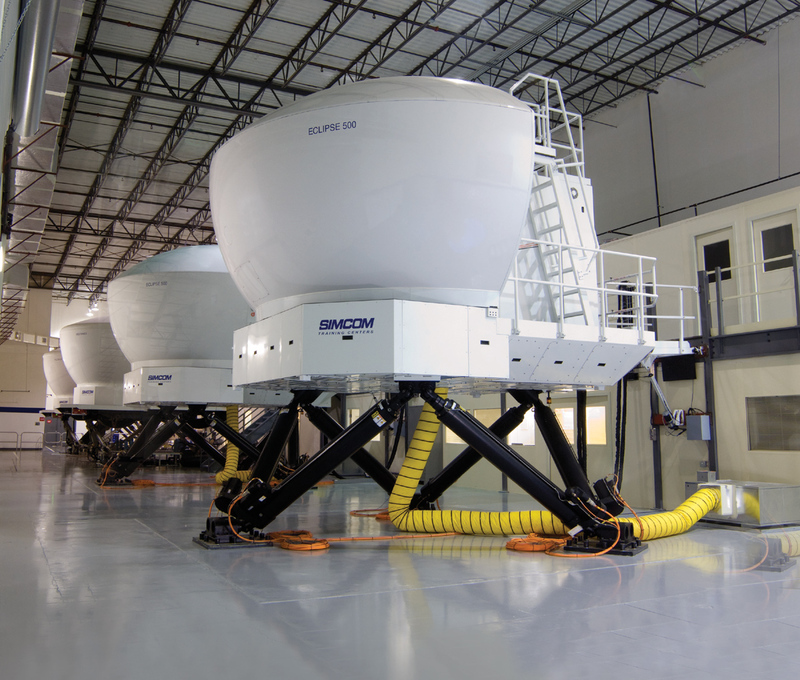 Opinicus built the Eclipse 500 Simulators for Eclipse Aviation and sent them to the United Airlines Flight Training Center in Denver, Colorado. Eclipse Aviation originally had United Airlines handle their training program. When Eclipse Aerospace took over the assets of Eclipse Aviation, they selected SIMCOM to handle the Eclipse 500 training program in March 2010. The Eclipse 500 Simulators were then moved to SIMCOM's training location in Orlando, Florida. FlyRadius believes that the Eclipse 500 Simulators at SIMCOM are the same ones that were originally at the United Airlines training center. Currently SIMCOM is the official training provider for the Eclipse 500 and has Eclipse 500 simulators. 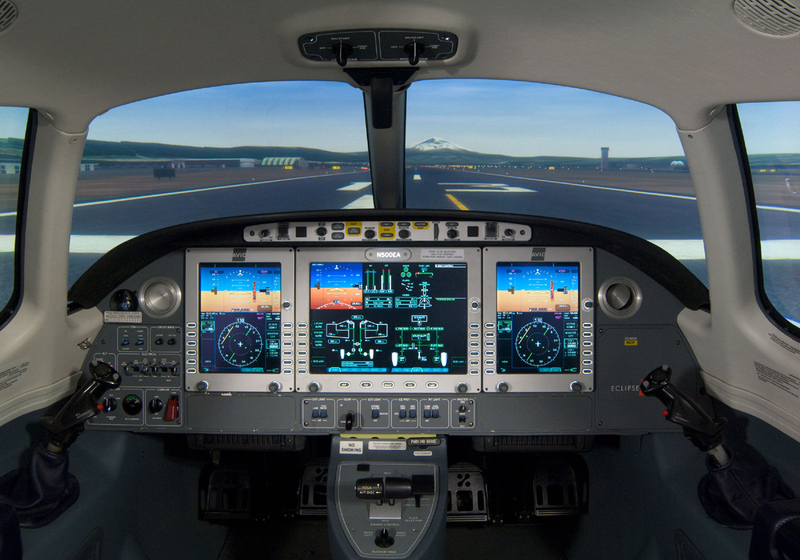 SIMCOM has upgraded one of the Eclipse 500 simulators with the new AVIO IFMS avionics from Eclipse Aerospace. The Federal Aviation Administration's (FAA) certified simulator list shows that their are 4 certified Eclipse 500 jet simulators, with only two active. The two active simulators are the SIMCOM simulators. Both of these simulators are full motion level D.
There are also other companies that developed Eclipse 500 Simulators. The two non active Eclipse 500 simulators on the certified simulator list are listed as being operated by Higher Power Aviation, Inc. Excel Aviation was another company that built an Eclipse 500 simulator. They anounced the development of the Eclipse 500 simulator at the EAA's Airventure in 2008. Excel Aviation's Eclipse 500 simulator is called the ExcelSim and is powered by X-Plane flight simulation software from Laminar Research. FlyRadius currently does not know if this simulator is still available. Above Eclipse 500 Simulator Cockpit Photo at SIMCOM by SIMCOM. Copyright SIMCOM. Used under the fair use provision. FlyRadius has not spotted any Eclipse 500 simulator models for Microsoft Flight Simulator. The Eclipse 500 Simulator is also called the EA50 Simulator and the EA-500 Simulator.